Endurance Rides are races over a trail of 50 to 150 miles. Terrain can be varied and challenging. The events are commonly held over one to three days. Horses are checked by qualified veterinarians and judges before, during, and after the ride. Your first endurance ride will likely be a one-day event of about 20 or 25 miles. To win you must maintain a fast pace of over 10 miles an hour, but many people ride just to finish. In North America, the U.K., Australia, and many other places, every caution is taken to ensure the safety and health of the horses. There has been some controversy within the sport, because it is very easy to simply wear a horse out, and deaths have occurred. But, in places where the rules of the sport are respected, and the welfare of the horses is the top priority, relatively few injuries or other mishaps occur. If you are riding to win, you'll have to learn to condition your horse so that it can maintain a steady, fast pace over long distances. The first horse across the finish line is the winner. For many, the goal is to ride the distance and have their horse finish sound and healthy. The mantra for long distance riders is "to finish is to win." Almost any horse, except the heaviest draft breeds, are suitable for endurance riding. Horses with heavy muscles such as cobs, draft crosses, and ponies may be suitable as long as they aren't pushed to travel too fast. Arabians tend to be the most suitable. The most important piece of tack for an endurance rider is the saddle. To begin you may use any saddle that is comfortable and fits both horse and rider. If you stay with the sport, you may want to use a special, or even custom-made endurance or trail saddle. Along with your saddle, you'll need to have at least one girth and saddle pad or blanket, and it's a good idea to have extras, so you can change them if they become wet or soiled. There are no rules about the type of bit or bridle you may. Synthetic bridles are easiest to clean. A bitless bridle or endurance bridle makes it easier for the horse to eat or drink on the trail. At vet stops, you may wish to use a halter and lead rope, or you may decide to remove the bit from an endurance bridle. Sponges and buckets, coolers, rain sheets and blankets are necessary to bring along, so that you may cool your horse out if it is hot, or keep it from getting it's working muscles chilled in cold weather. You'll also want brushes and sweat scrapers to remove dried sweat and mud. Feeding your horse on the trail is important. So, you must bring along hay, grain, and supplements. Many endurance riders feed wet beet pulp to provide energy and to get a bit more water into their horse. Dehydration is a danger when a horse is sweating hard, so electrolytes and water are very important. You will also need food for yourself. Keeping yourself hydrated is essential. You will also need to dress comfortably and be prepared for any weather. This is another sport where dressing in layers is the best strategy, especially since you'll probably be riding from the cool morning hours and throughout the hottest part of the day. If there's a chance you'll be riding in the dark, a headlamp is useful. Your horse will probably need some sort of hoof protection unless you are absolutely sure the trail will be soft footing. Hoof boots will probably be sufficient, but many endurance riders have their horses shod with caulks if the footing is at all rocky or slick. When you arrive at the ride site, make your horse comfortable. Participants often camp overnight as starts are often in the early morning hours. At the entry desk, you'll receive your ride package containing a number and score sheet as well as other information. You'll take your horse to the veterinarians and judges for a thorough examination. They record information such as TPRs and hydration. You'll be asked to trot your horse out on a loose lead so they can assess its soundness and attitude. After the vet check, you'll bed down for the night. Picket lines or portable stalls are common ways of containing horses overnight. You'll want to pre-load your horse with an electrolyte solution and make sure he is eating and drinking. Early in the morning, you'll start out on a trail. All competitors start at the same time. These mass starts can be exciting. Some people like to wait at their trailers until the dust settles. You'll want to give your horse every opportunity to drink and eat along the trail. Veterinary checks along the way make sure your horse is healthy and sound. Your horse will be checked very thoroughly again at the end. Awards and prizes are handed out after the majority of horses have finished. Your horse should be in good health, and perfectly sound. If your horse is overweight or very unfit, start very slowly. Begin by riding four to six days a week, five miles per workout, at a pace of four to six miles per hour. Gradually increase your time, distance and speed. Start conditioning at least 8 to 12 weeks before the event. Before attempting an endurance ride, you may want to participate in some competitive trail rides or mileage rides where you can learn to pace your horse over slightly shorter distances. Ride over varied terrain including steep climbs. Teach your horse to be calm around the highway and off-road vehicles. Dress comfortably and bring a change of clothing. Know your horse and learn to recognize signs that he may be tired, uncomfortable, or lame. 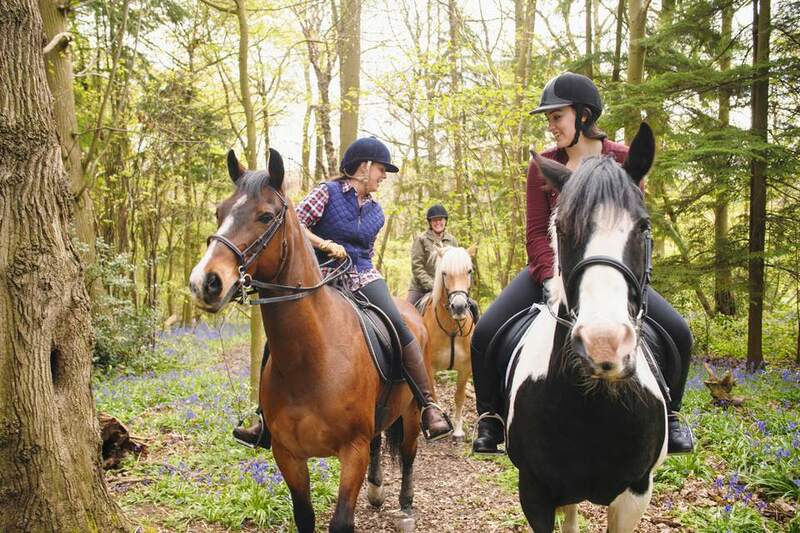 You'll want to recruit a support crew to help look after your horse and you during the ride. Learn how to give your horse electrolytes. This is a challenging sport. Your goal won't be to win your first endurance ride. Many riders ride just to finish. Riding a horse over a trail of 50 miles or more is an achievement whether you place first or last. You'll get fit, make friends, and learn more with each mile.